Anyone who loves the Lord’s Prayer will love this Lord's Prayer ring. 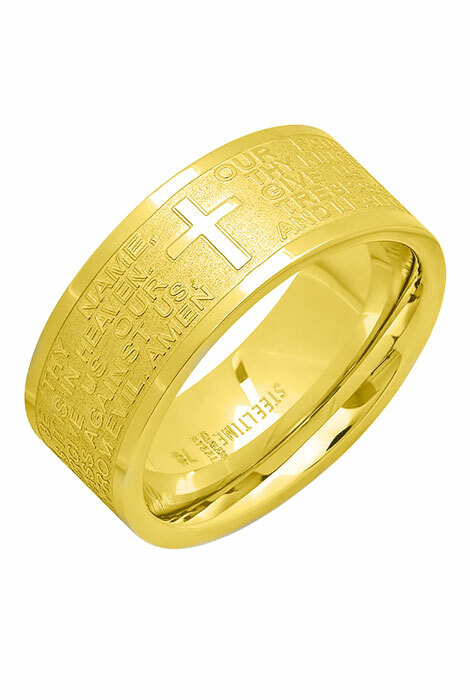 Shining 18k gold-plated steel prayer ring features the complete prayer around the outside and is accented with a cross. Made from stainless steel, a quality choice in jewelry design because of its beautifully polished finish, durability, and resistance to rust, oxidation and discoloration, even in humidity. 5/8” W band. Choose from 7 sizes to fit men or women: 6, 7, 8, 9, 10, 11 or 12. Polish cross ring with a soft, dry cloth. Allow 2–3 weeks for delivery. I have no pros or cons, I love it, it is beautiful, I will wear it with pride after our priest blesses!